Naturally, when people find something they like, they tend to want more. Lately it seems that America just can’t get enough of zombies. Apparently they can’t find nearly enough stories about the living dead as they’d like. After all, what can you do when Hollywood limits stories to: White Zombie, Revolt of the Zombies, Revenge of the Zombies, Teenage Zombies, Zombies of the Stratosphere, Night of the Living Dead (1968), Night of the Living Dead (1990), Dawn of the Dead (1978), Dawn of the Dead (2004), Shaun of the Dead, Day of the Dead, Land of the Dead, The Evil Dead, Evil Dead II,The Re-Animator, Zombie vs Ninja, Redneck Zombies, Scooby Doo on Zombie Island, 28 Days Later, Hellsing, World War Z, Resident Evil and the Walking Dead. In such a generic dearth, one may have to turn to literature, such as: The Zombie Survival Guide , Herbert West: Re-Animator, Pride and Prejudice and Zombies, Pride and Prejudice and Zombies: Dawn of the Dreadfuls, Warm Bodies, Undead, The Dead, The Dead of Night, The Living Dead, Pride and Prejudice and Zombies: Dreadfully Ever After, Dead@17, Shaun of the Dead, World War Z, the Resident Evil novelizations, and the Walking Dead. And when you run out of those, unfortunately, zombie video games don’t offer much more than: The Last of Us, Survivor FPS, Amy, Lollipop Chainsaw, ZombiU, Dead Block, Dead Island, No More Room in Hell, Yakuza: Dead Souls, Call of Duty: Black Ops: Zombies, Dead Nation, Red Dead Redemption: Undead Nightmare, Zombie Panic in Wonderland, (the aptly named) I Made A Game With Zombies In It, Minecraft, Plants vs Zombies, Plants vs Zombies: It’s About Time, Zombie Apocalypse, Dead Space, Left 4 Dead, Resident Evil (1 through Six, Zero, Code Veronica, the Umbrella Chronicles, and Outbreak)…and the Walking Dead. And if you blow through all those, I left off literally hundreds of titles listed on Wikipedia. Zombie media has worn out its novelty. However, people haven’t quite figured this out yet. Every time a book, movie, TV show or game pops up with “Zombie” or “Dead” in the title, people flock to stores with no realization of how frequently artists use zombies to criticize mass consumerism. 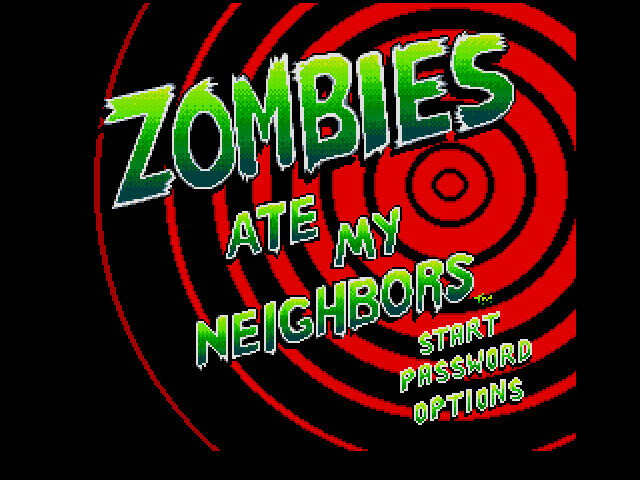 Given the situation, I face a challenge in talking about “Zombies Ate My Neighbors,” a run-and-gun action/horror game from 1993: namely, no one cares about zombies anymore. The title, however, might confuse people. Rather than a description of the challenges facing the player, it broadcasts the game’s sense of humor which parodies famous horror films prior to the sixties. 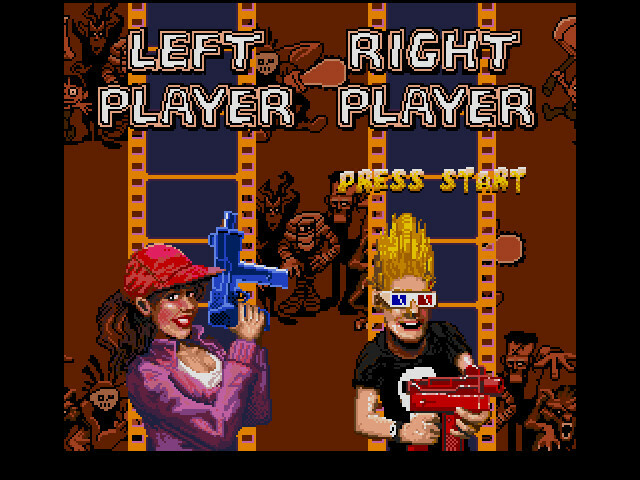 The game has a simple design; you select either the girl character, Julie, or the 3D-glasses-sporting, Vegeta-haired boy, Zeke. After loading a squirt gun–presumably with a combination of Holy Water, WD-40 and sulfuric acid–the chosen avatar begins a mad dash through a top-down view of suburbia, trying to prevent–you guessed it–zombies from eating your neighbors. Initially, you have ten people to save per level, but since they have a tendency to stand by obliviously as werewolves knead their intestines like a ball of dough, this number drops rather quickly. If a victim dies, you begin with one less neighbor to rescue in the next level. Ever wonder what they keep in the back room at the grocery store? Zombies, rather than the focus of the game, serve more of a basic enemy goomba-type role, cheap, limitless fodder to throw at you whenever the game feels obligated to give you an enemy, but doesn’t want to put too much effort into it. After the first few levels, a whole slew of mummies, pod people, Chucky dolls, chainsaw maniacs, Martians, giant ants and more crawl out of the woodworks to grab a tasty mouthful of soylent suburbia. The developer, Lucas Arts, clearly put some thought into this, which elevates Zombies Ate My Neighbors above most of the zombie books, films and games I listed at the beginning of this article. The game assumes familiarity with classic horror, then uses that as a foundation for parody. 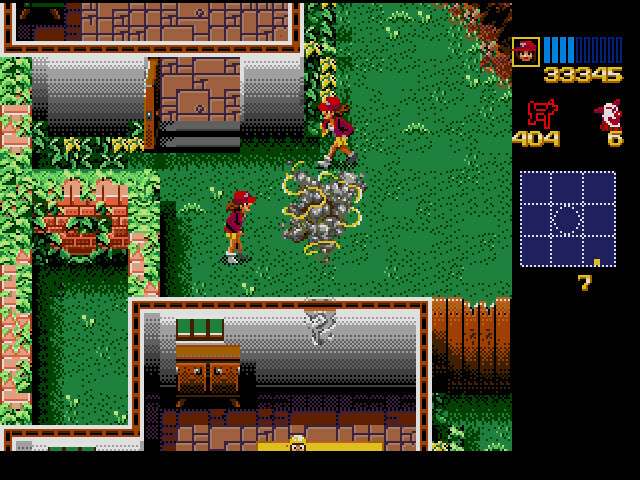 Each level sports an introduction with humorous titles such as, “Evening of the Undead,” “Dances With Werewolves,” “Where the Red Fern Growls,” “The Day the Earth Ran Away,” and more, with many sequel levels which proclaim themselves as “More Shocking” or “More Terrifying” than the one before it. 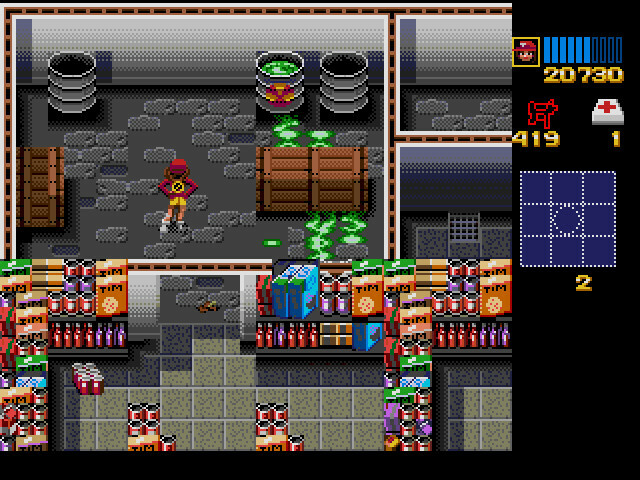 ZAMN provides an early example of a classic video game trope: using random every day objects as weapons. You start out with a squirt gun and pick up some logical weapons like a bazooka and a weed whacker, and certain objects like crosses make sense, but you also chuck a fair share of soda cans, plates, footballs, silverware (for werewolves), tomatoes and popsicles at the hoard of beasties. While it amuses me to no end envisioning what might happen if you fought a mugger by conking him with a popsicle, I have to side step that amusement for a word about combat. If I had any criticism for the game, it would stem from the combat system. You start with a finite amount of ammo and have to pick up more as you go along, and unlike the survival horror genre, you can’t usually just run away from fights. The zombies must have recently feasted on the Wicked Witch of the West because they explode at the slightest touch of water, but most enemies have significantly more health. In addition, the game only sometimes lets you know that your chosen weapon has any effect on the monsters at all–bosses blur out-of-focus briefly, and some enemies flash, but only a few and not with every weapon. While discovering halfway through the game that yes, in fact, the squirt gun does harm mummies and giant ants may have only inconvenienced me slightly, I did from time to time realize I had spent the last thirty seconds launching ammo just slightly to one side of a monster, like I wanted to kill an even worse monster standing behind it to gain this monster’s trust back. Unfortunately, to add to this, several monsters flit around like humming birds, making them hard to hit, and so I’d find myself tossing away my weapons supply as though it would give me cancer. Enemies in general, but bosses more than others, have a little too much life, and I found certain key fights dragged on to the point of boredom. Snakeoids, a recurring boss seemingly based on the graboids from the movie “Tremors,” often found themselves the victims of long strings of verbal abuse. Not only did they need a sturdier pounding than Rasputin before they died, but they could only take damage for brief moments when they surfaced to attack. Sometimes they’d surface at reasonable intervals, and on a few occasions I got them to glitch out and surface repeatedly, but most often I’d just stand for minutes on end like a donut tempting them to ruin their diets while they ran circles around me, deciding whether they should eat me or not. They offset the NES-level of difficulty slightly by offering a password system. By entering a four-letter password, you can start near the last level played with none of the weapons except the squirt gun, one health kit, and the exact number of neighbors you had left. The fact that the game only has memory for neighbors actually doesn’t make the game as difficult as it would seem–fewer neighbors to rescue means less time spent in each level, and while you may not pick up as many items that way, you’ll take less damage and last longer. Still, if you lose all your neighbors, you lose the game. Furthermore, the game rations out passwords once every few levels like it might run out, so you may find yourself repeated a lot of stages that you already know you can beat. But mostly this nice little gem of a game, now twenty years old, still finds ways to entertain, not just with gameplay, but also by tapping into timeless horror icons, much like the original Castlevania did. And even those who might not have a library of silver-screen films or the knowledge of trivia to make the connections can still appreciate the light-hearted horror humor presented in Zombies Ate My Neighbors. Maybe we can look back to some extant pieces of the zombie canon and move on to the next big monster fad…I don’t know…werewolves or something. We have enough already to keep us entertained for a long time without getting bored. We don’t need to see any new, terrible zombie films. It’s a good thing Zombies Ate My Neighbors never sunk that low. 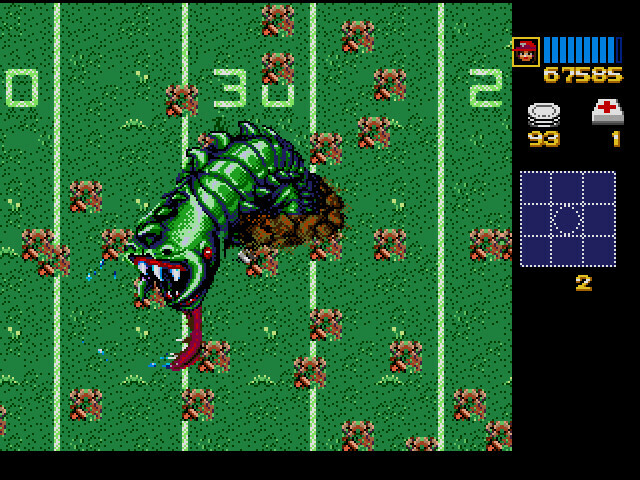 This entry was posted in Sega Genesis (Megadrive), SNES, Wii and tagged Sega, SNES, wii, Zombies Ate My Neighbors. Bookmark the permalink.